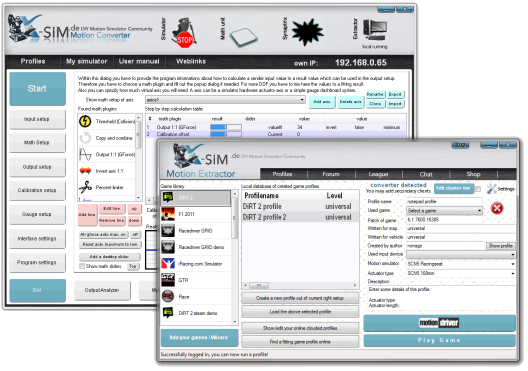 X-Sim is universal software for commercial simulators and the Do It Yourself community. It is a ongoing private project with ten years of development history. It is freeware for non-commercial use. Outdated simulators can be migrated to X-Sim with full hardware and games support. Several companies make and sell X-Sim compatible hardware and software. Heuristics allow it to work with new games without having to wait for new games support. a.) The first solution is generic support of the biggest game engines and their official interfaces. b.) A motion driver with Microsoft Direct3D (similar to the 3d stereoscopic drivers), Force Feedback, OpenGL and direct memory access support. The range of simulators that can be used with X-Sim go from simple racing seats to big hydraulic flight simulators to virtual reality simulators for 3D applications that use D3D/OpenGL. 1.) Free for private usage - requires a working internet connection. If you are willing to add your project to our site, you are eligible to get a stage 2 key. 2.) Supporter edition - is designed for professionals and users that use it extensively. It does not require a working internet connection. Commercial users have to read the commercial terms of usage on this page. We are happy that you discovered our page, and would like to invite you to continue exploring the rest of it. Use the menu on the left side and the navigation buttons on the top of the page to get around. We recommend to visit first the documentations page and have a look to our video tutorials. If you have questions or comments, please contact us through the forum. If you would like to report a bug please use the bug tracking system.